A friend shared a photo of feeding temple cats at the Buddhist Temple at Sa Roca in Menorca. It sparked the sharing of the following memories in my journal this morning. Such lovely beings, temple cats. One, we named Manjushri, found him, the tiniest thing, hiding in a hole in the volcanic rocks to the side of the temple, back in 2012. when we were blessed to be temple caretakers for a couple of weeks. Rising each day at 4:30am, I would walk to the temple, sometimes in the company of cats, sometimes tortoises. Long morning sittings, reading the Dharma, and contemplating, in the temple. Just myself and later, after her own practice, and a run, Ananda. Changing the offerings, sweeping and cleaning, letting the light and air in, throwing open the doors and gates. Sipping tea and impromptu picnics under a tree outside, reading the Dharma and chewing it over, sharing our own Dharma, joined by Agustina. Visitors came and smiled and sat, much silence. A young policeman, found gazing at the 8 foot golden Buddha from the doorway, completely in love, barely able to speak, other than the repeating words "He’s so beautiful, SO BEAUTIFUL." His eyes were alight. Once, invited to take Geshe-La's throne and give the Dharma, when some people showed up asking for the Dharma of meditation in English. There was only me, and Agustina insisted, enthusiastically, as always. Bowing to Je Tsongkhapa and Geshe-La (who had named me Chondzin – Holder of Dharma in 2003), I invited them into to my Heart to speak, and introduced the temple guests to Geshe-La's book, Modern Buddhism. We meditated, and they left quenched, leaving enough offerings for us to serve the temple with replacement light bulbs. More light! These, and so many more beautiful memories of this Holy place and it's Sangha. So happy for all the other friends who have visited this place too, there's something about this place… Kelsang Lanma was among those who carried the Buddha through the streets on Easter Sunday, cheered on by locals. Joanna painted his lotus seat and tended the roses. Ananda and I cleaned out the fish pond, clearing a year or two of fish poop with our bare hands and whatever scoops we could find, counting 18 fish, whilst the temple cats watched eagerly. It took over a day, so we made them overnight guests in the temple, in giant bowls of blessed, pure water, taken down from the shrines. We bought them food and the neighbours children began to come and feed them. So much light, so much love, Buddha found in every speck of dust, every ant. Geshe-la showering blessings all around. What did I do to deserve all of this? Exhausted from work, I showed up, needing rest and retreat, but seeing help was needed, I welled up with life and helped. Thanks to Tina, for sharing the photo that sparked the sharing of these memories. 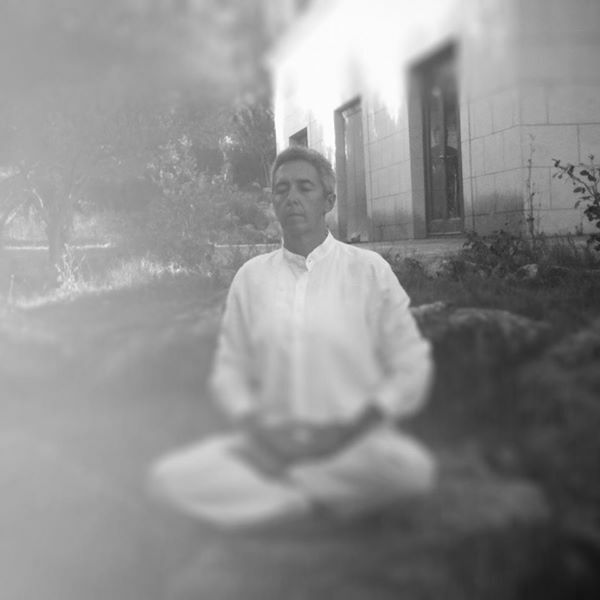 Now an International Retreat Centre, Sa Roca is a fresh vision of light, love, of Buddha, Dharma and Sangha.